Posted: Tue Oct 19, 2010 5:33 pm Post subject: Re: New AR Build! Thanks shrpshtrjoe and fnuser! The first cut we made was an intake slot in the bottom with a high-speed steel bit. The carbon fibers dulled the bit before we completed the slot. Found a carbide milling bit that did short work of the carbon. We thought the round hole looked a lot cleaner and better than a slot so laid out the 5 holes per side. There should be enough for ventilation and the holes are not that big that the hinder my grip. Eager to see your 6.8. I've been hearing more and more good things about its knock-down capability particularly with the new 85 gr Barnes. Posted: Tue Oct 19, 2010 5:35 pm Post subject: Re: New AR Build! Very nice slim. I have a Mini 14 in 6.8. Its fun and hits alot harder than the 223. Posted: Fri Oct 22, 2010 6:45 pm Post subject: Re: New AR Build! Posted: Sat Oct 23, 2010 6:07 am Post subject: Re: New AR Build! fnuser, did this guy take your nut? Posted: Sat Oct 23, 2010 6:39 pm Post subject: Re: New AR Build! 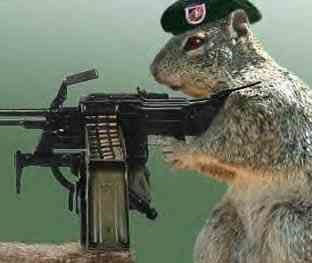 Rebel Squirrel, no way..........he's into Coopers not AR's !!! Posted: Sun Nov 07, 2010 3:32 pm Post subject: Re: New AR Build! Posted: Sun Nov 07, 2010 3:38 pm Post subject: Re: New AR Build! Posted: Sun Nov 07, 2010 4:35 pm Post subject: Re: New AR Build! fnuser, SWEET!!!! It is amazing how many different options there are for AR platforms. I thought I did an exhaustive search for a handguard and you've selected one I never saw. It looks like a very nice one. Let us know how it shoots. Posted: Sun Nov 07, 2010 9:12 pm Post subject: Re: New AR Build! My next ar-15 build is gonna be a 458 socom!45-70 power-in a semi auto!However not really a build-just a kinda snap on arraingement! Posted: Mon Nov 08, 2010 6:58 am Post subject: Re: New AR Build! I've been studying the Big Bore ARs on the side. The 458 SOCOM has the benefit of all the .45-70 bullet selection. The 450 Bushmaster appears to have more down range energy. Check out this posts and add your comments to it. Posted: Mon Nov 08, 2010 10:08 am Post subject: Re: New AR Build! I had both the 450 THUMPER and the 458 SOCOM and now only have the 458 SOCOM. I love the thing. The fact that you can use the 458" bullets makes it down right awsome. The 451" for the Bushmaster limited its over all usefullness. Posted: Mon Nov 08, 2010 7:30 pm Post subject: Re: New AR Build! Posted: Mon Nov 08, 2010 8:40 pm Post subject: Re: New AR Build! I looked at the install and it looked easy to do and rugged when complete. The sling swivels look like a neat feature. I need to find a sling for my M4. Posted: Tue Nov 09, 2010 12:09 am Post subject: Re: New AR Build! great to see those smoke pipes coming along. the 6.8 is a real interesting option its one of those cartridges that you dont know weather or not its gunna take off or fizz. Posted: Tue Nov 09, 2010 5:09 am Post subject: Re: New AR Build! The selection of bullets for 6.8 has improved.